World of Warship players of the European server, Christmas is sailing full speed ahead towards us! On this occasion, the clan [BOBS], The Brotherhood of Beards are organizing their very First Annual Christmas Event. Starting from the 13th of December, every day until the Christmas Eve, The BOBS will be sailing around in World of Warships looking for players to reward with amazing gifts! Be aware tho, only the good players will have a chance to win something. The ones demonstrating their capacity to play for the team, their good behaviour but most of all, the way they can make the battle as enjoyable as possible! Each day, a lucky player will have the chance to win a price that can go from some doubloons to a Tier VIII premium ship! 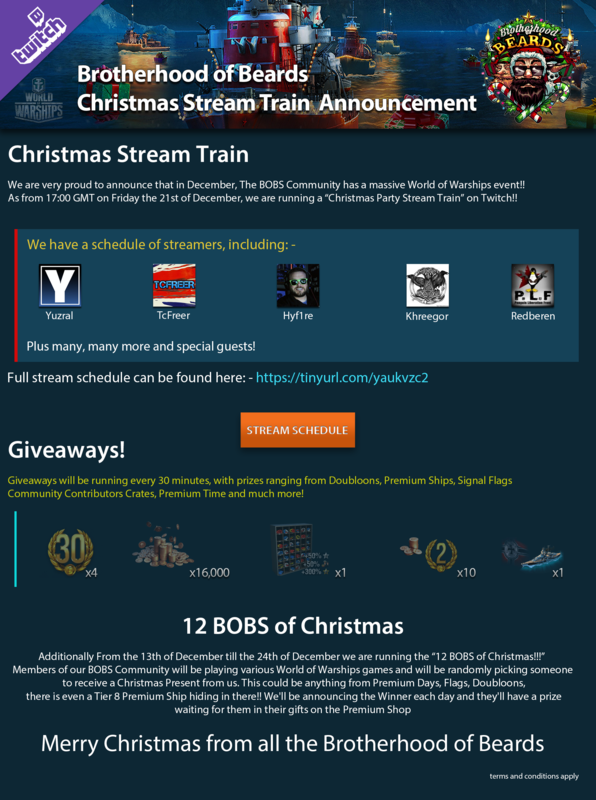 Starting from the 21st at 17:00 GMT, The BOBS are organizing a great Stream Marathon during which giveaways will run every 30 minutes with a great variety of gifts! Doubloons, premium ships, containers and much, MUCH more! Come and enjoy the cold days of winter by watching streamers like Yuzral (not to confound with me ;)), TCFreer, Hyf1re and a lot of other fantastic streamers!